On Wednesday, we were in St. Louis for EL's 6-month Neurology checkup. All is well. She's doing great, and hasn't had any seizures for 8 months! (Yayyyy!) So, we will continue to keep her at the current medication dosages and return again in another 6 months. 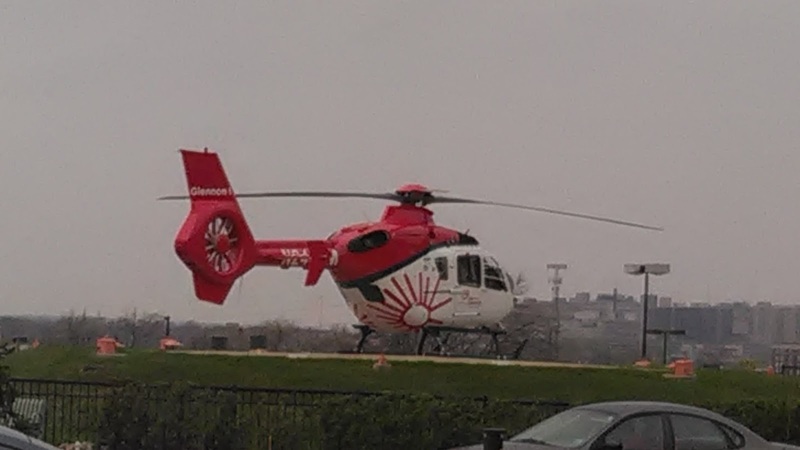 While were were at the hospital, a helicopter landed. EL has had helicopters on her mind lately because she has been saving her money to buy "My First Flyer" (a remote-controlled helicopter she has been wanting). So, when she saw the helicopter on the landing pad, she looked at it and said, "Oh, its a REAL helicopter!" She was so excited to see a real one up close. She said she doesn't want to ride in one, but just likes to watch them fly. I don't have any interest in riding in one either, especially not for emergency medical issues. And, I agree with EL that they are neat to see in flight. However, if you see one of these medical helicopters flying in your area, I encourage you to take a moment to stop and pray. and for the peace of the family members who are worried about their loved one. Also, take the opportunity to pray for their salvation (if they don't know the Lord), or that this difficult time will help strengthen their faith (if they are already Believers).